The Arlington Public Schools Lifeguarding program offers training in the nationally recognized American Red Cross Lifeguard Program. The course prepares individuals 15 years and older to become professional lifeguards by introducing them to concepts and skills necessary to prevent and respond to aquatic emergencies in a swimming pool. Class participants must be 15 years or older before the last class date. The skills taught include water rescue, Cardiopulmonary Resuscitation (CPR), the use of an Automated External Defibrillator (AED), and First Aid. Successful participants will receive American Red Cross certification in Lifeguard Training, CPR/AED for the Professional Rescuer, First Aid. Because this is a skills based training class, participants must attend all class sessions. There can be no exceptions. Surface dive, feet-first or head-first, to a depth of 7 to 10 feet to retrieve a 10-pound brick. Return to the surface and swim 20 yards on the back to return to the starting point with both hands holding the object and keeping the face at or near the surface so they are able to get a breath. Candidates should not swim the distance under water. Exit the water without using a ladder or steps. Course Fee: $275 ($50 Non-refundable registration fee) Successful candidates will be eligible for full- and part-time employment as a Lifeguard with Arlington Public Schools. Hourly pay rates range from $9.15 to $14.50 depending on previous work experience. Income-based fee reductions are available for qualifying Arlington Residents. Contact the Aquatics Management Office at 703-228-6263 for more information. Blended Learning Class Some of our session are being offered using the American Red Cross Blended Learning curriculum. Students will be able to complete a fair amount of the class work online by using a hot-link, provided to them after they have successfully completed the Pre-Course session. To register, please complete the Registration Form by clicking here. Please note: Courses must have a minimum of 8 participants to run. 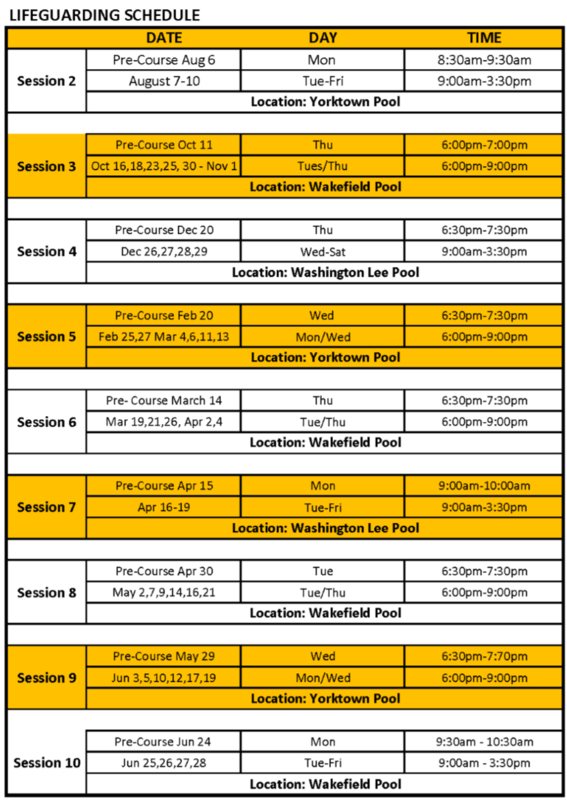 This course will prepare you to teach the American Red Cross Learn-to-Swim, Preschool Aquatics and Parent and Child Aquatics Courses. Candidates must be at least 16 years of age on or before the last day of the course, and successfully complete the pre-course session. The course will identify key elements and strategies for planning and preparing effective and safe swim lessons, and class management principles. Candidates will learn the importance of effective observation for teaching and how to develop it. Develop the ability to effectively communicate about participant’s progress in swim lessons and modify teaching to meet unexpected challenges including dealing with participants who misbehave. Learn skills to accommodate participants with disabilities and other health conditions. Candidates must complete all reading assignments, attend all class sessions and participate in all activities, successfully complete all practice-teaching assignments and pass the final written exam with a minimum grade of 80 percent (40 correct answers out of 50 questions). Candidates must be 16 years old. Prerequisites include the ability to swimming 50 yards of the 5 primary strokes and 10 yards butterfly at a Level IV proficiency. Please note: Course must have a minimum of 8 participants to run. Candidates must be 17 years old. Prerequisites include Fundamentals of Instructor Training (FIT), and passing a pre-course written/skills test of Lifeguarding and CPR/AED for the Professional. in shallow water. After removal from the pool, the infant appears unconscious. face-down in the pool. The victim is responsive when turned face-up. the middle of the pool. He is having difficulty and cannot swim to shallow water.